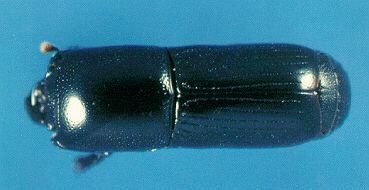 Histeridae: The histerids are black, shiny, hard-bodied beetles with short elytra. The posterior abdominal segments are exposed dorsally beyond the elytra. Platysoma (Cylistix) cylindrica (Paykull) (figs. 4A, 5): P. cylindrica (4.3 mm) has a spiny front tibia and a pointed prosternum (fig. 4A). P. (Cylistix) attenuata (LeConte) (figs. $a, 6): P. attenuata is similar to P. cylindrica but is smaller (3.1 mm) than P. cylindrica. Also, P. attenuata appears thinner when viewed dorsally (fig 6). P. parallelum Say (figs. 4B, 7): P. parallelum (2.7-3.6 mm) can be distinguished from these first two species because it has a rounded prosternum (fig. 4B). In addition, its pronotum is short relative to the length of the elytra (fig. 7), and it lacks deep pits on the metasternal plate. Plegaderus Erichson (fig. 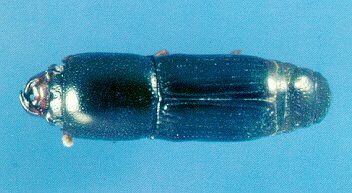 8): Plegaderus is a tiny (1.5 mm), oval, shiny, black beetle. Plegaderus has short elytra and is punctate with a smooth band on the prothorax.